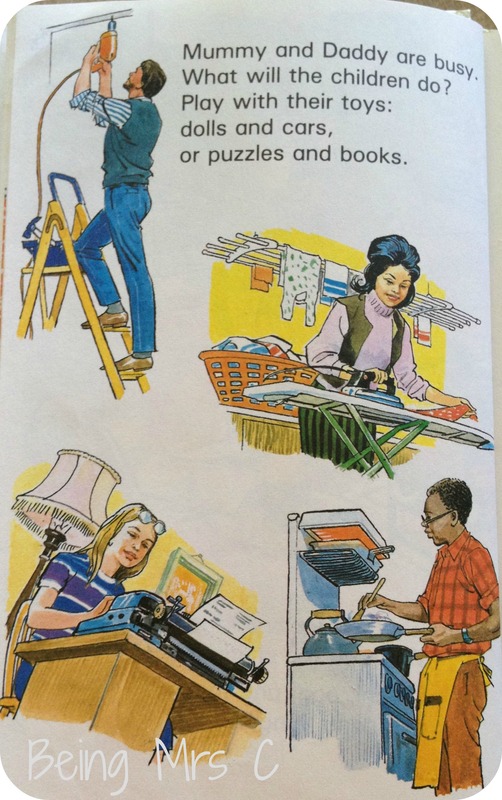 I’m going through an 80s phase with Ladybird books at the moment. After ignoring all the glossy covered ones for years I’m suddenly finding some absolute gems in charity shops and in a big pile that a friend passed on recently. I thought I’d got my collecting habit nicely limited, but it seems maybe not. Series 833 was called Toddler Books and they’re just perfect for Master C now that’s heading towards his second birthday. Now I think there were seven books in this series, but I have to admit that I’m not totally sure. I originally picked up one of these for 20p when Master C showed an interest in it – mainly as it had a digger on the cover – but I’m now actively trying to seek them out. 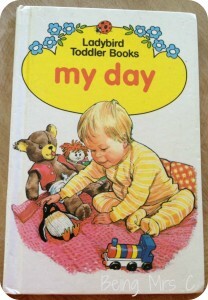 My day is a lovely little book to simply show a toddler what their day looks like in terms of the regular things that they do. 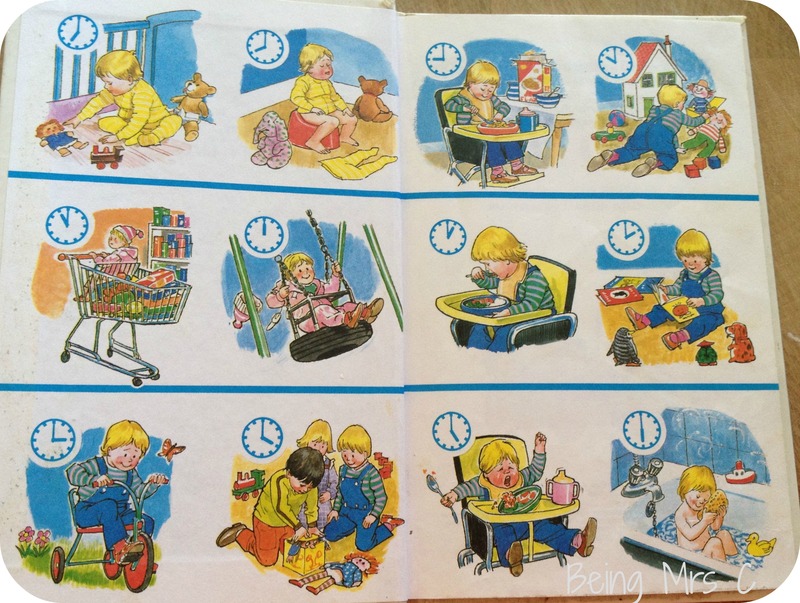 Published in 1983 the day has changed a bit for some children, especially in terms of parents working or how often children go on trips out, but the basic shape of the day is very similar. Obviously there’s no mention of toddlers being given an iPad to amuse themselves with whilst mum (or dad) cooks dinner or does some other job around the house, but I do find it quite interesting to see how much more children appeared to just get on and play without requiring input from their parents. Or maybe it’s just my children who demand my time a lot! I love this picture of a typical morning scene though. My only chance of a hot cup of tea in a morning is getting up before they wake – and even then it doesn’t always happen! 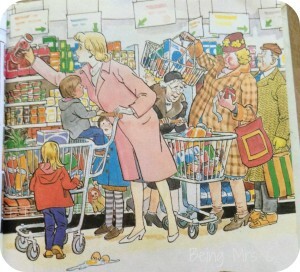 Being taken to the supermarket to do a “big shop” was often quite an event for toddlers. 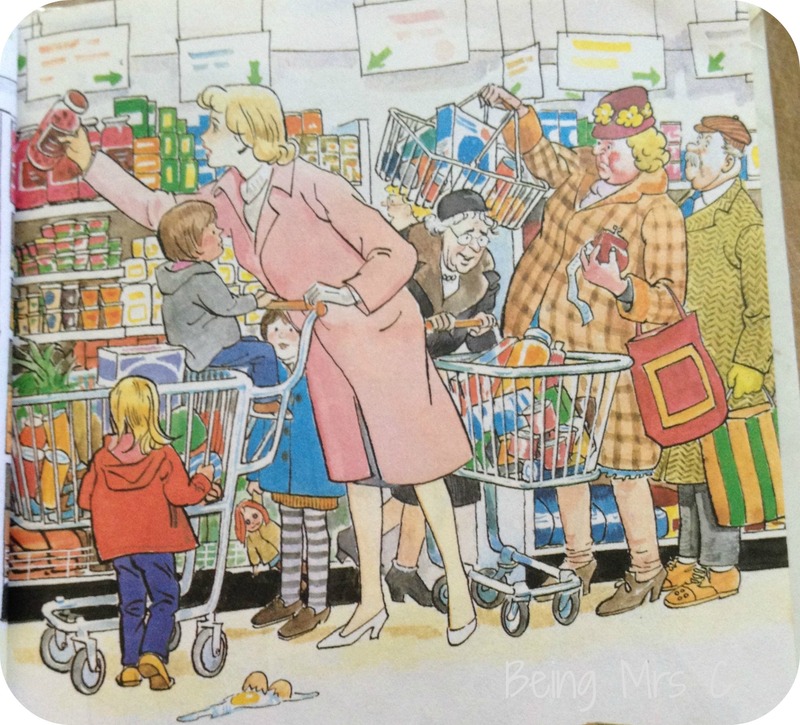 I certainly remember being taken round the supermarket like this. Somehow it seems that if I try “being busy” with anything it’s a guarantee that one or both children will need my attention right then. Normally as one of them’s decided to do something dangerous, whilst the other one screams at me so I notice. Yet, if I’m trying to get them upstairs for bath time suddenly they’re capable of playing nicely on their own for as long as I’ll let them. Funny that. Did this not happen in the 80s then? With a little one who still refuses his food, it’s actually quite nice to see similar happening in this picture – although to be honest if someone who looked as creepy as that was trying to spoon feed me something I think I’d refuse too! How can you not fall completely in love with a bit of 80s nostalgia like this? Ah, this one was in the new stash that I acquired at the weekend, I love it! I’ve also been wondering about the Mummy and Daddy being busy and the children just playing by themselves. Mine never do that either! I like the parents in bed while the children play, we do similar although like you say it’s an iPad and not toys! 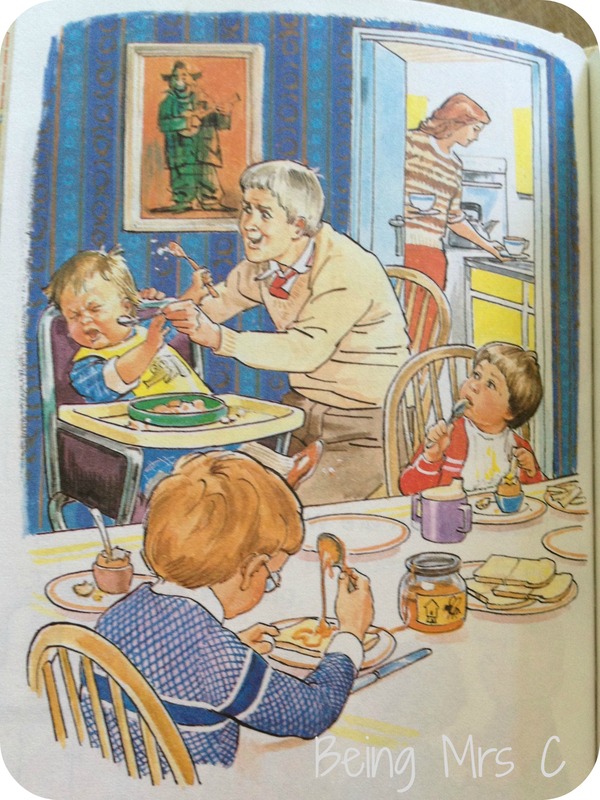 I’ve joined in again this week with some Stories of Special Days and Customs http://www.jenniferslittleworld.com/2014/07/ladybird-tuesday-stories-of-special.html thanks for hosting! 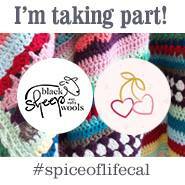 Great to have you joining in again. And when I’ve got a spare mo I’ll be updating the massive index of all the books linked up with Ladybird Tuesday so far. On my to do list for the summer. 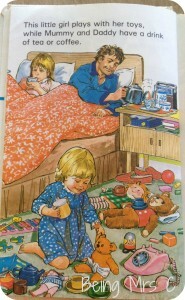 My mum had this one in the “grandchild box” and so my 2 remember reading it with her when they were little! 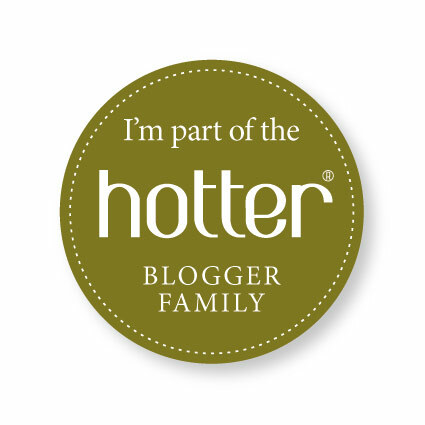 I have a collection of lady birds somewhere – I must dig them out and join in! Awww this book looks so sweet! Love vintage books! This is really making me want to go and rummage in charity shops to see if I can find any of my own! 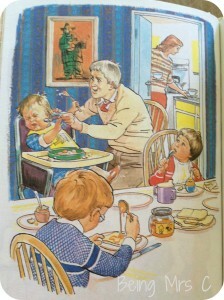 You’re right, creepy man trying to feed the child does look odd! 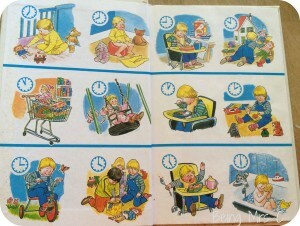 It’s bad when you look at these books and think ‘I used ot have a toy just like the one in that picture!’ isn’t it? Not bad at all – in fact exactly what I keep thinking too! 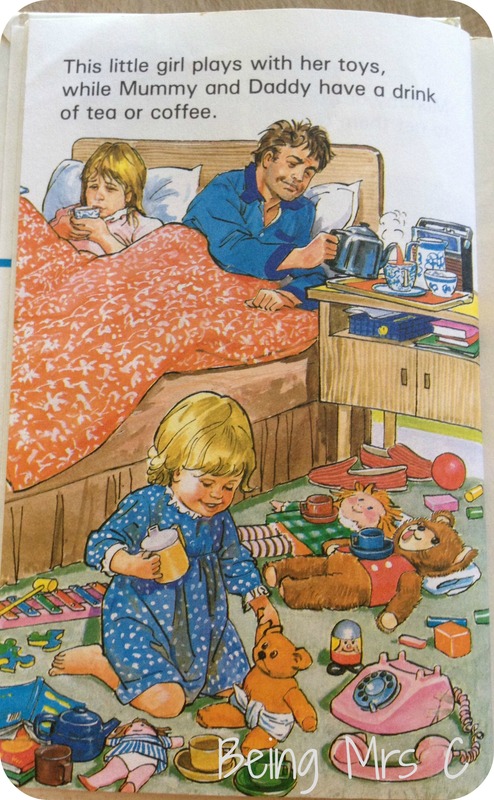 There are 7 titles in the original series of Toddlers Books which is Series 833 and they date from 1983. We currently have 5 of these titles in stock. So my suspicions were correct – thank you David. Hahahahahahaha I think anyone would refuse food from that creepy man. I think we have loads of these books at my mums, I’ll take a look when I’m down and see if there are any you need for your collection.